'DNA computer' is unbeatable at tic-tac-toe - tech - 17 October 2006 - New Scientist Tech: "A computer that uses strands of DNA to perform calculations has mastered the game tic-tac-toe. MAYA-II, developed by researchers at Columbia University and the University of New Mexico in the US, uses a system of DNA logic gates to calculate its moves. A DNA logic gate consists of a strand of DNA that binds to another specific input sequence. This binding causes a region of the strand to work as an enzyme, modifying yet another short DNA sequence into an output string. 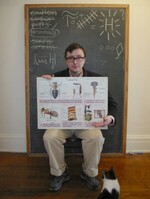 ...A human plays MAYA-II by adding a DNA sequence that represents their chosen move at a particular point in the game. This is added to all 8 wells that correspond to the outer squares on a tic-tac-toe grid. One limitation of the system is that the human player must always go second, after the centre square has been filled by the machine. 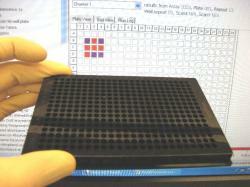 ...Each well contains between 14 and 18 DNA logic gates. After a human player makes their move, MAYA-II responds through a DNA reaction. The strand outputted feeds into a series of other DNA logic gates that link the different wells. This results in a chemical reaction that generates a green fluorescent glow in the square MAYA-II selects as its next move. The strand also interacts with the remaining wells, priming them to respond appropriately to future moves." Ubiquitous Media: The media that are ubiquitous throughout society provide "not just the potential for greater choice and flexibility in re-working content (tv programmes, movies, music, images, textual data), but also great surveillance (CCTV cameras, computer spyware, credit data checking and biometrics). The media, then, can no longer be considered to be a monolithic structure producing uniform media effects. Terminology such as 'multi-media,' and 'new media,' fail to adequately capture the proliferation of media forms. Indeed, as media become ubiquitous they become increasingly embedded in material objects and environments, bodies and clothing, zones of transmission and reception. Media pervade out bodies, cultures and societies. These ubiquitous media constitute our consumer and brand environment. Their interfaces and codes pervade our bodies and our biology. They pervade our urban spaces. They are ubiquitous in art, religion and our use of language. Yet from another angle art and language are, and have immemorially been, media." The journal Theory, Culture & Society will have been published for 25 years in 2007. To celebrate this anniversary, TCS has joined with the Interfaculty Institute of Information Studies at Tokyo University to develop the Ubiquitous Media conference. Someone has edited together clips from the Robocop and Terminator movies to create a fairly convincing battle between the two characters. It's quite well done. 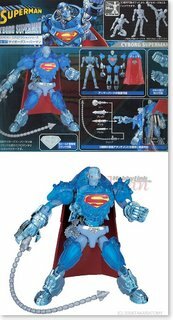 Microman Superman #3: Cyborg Superman: "Cyborg Superman is packed with armor parts (made out of clear plastic parts and metallic coated plastic parts) to suit him up and comes with 5 interchangeable weapons than can be attached to his palm including saw, blade, drill, barrel, and whip. The weapons can also be stored on his back underneath his cape. 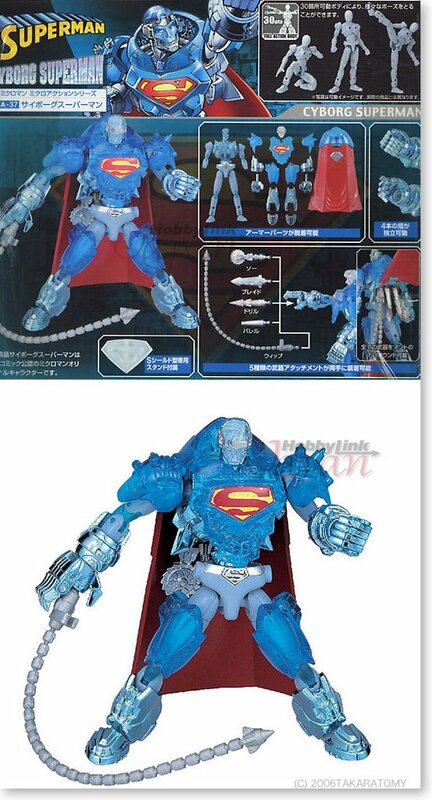 Fingers are individually articulated and a Superman logo stand is included." Chicago Tribune | The Watcher: "Q: I have to ask -- cyborg vs. werewolf. Who would win? A: 'It’s an age-old question. It’s a common enough to hear at a bar, people get into big arguments about it. I’ve got to say, cyborgs have all the advantages. The werewolf has the mere advantage of savagery. And claws. 'But 'cyborg' is such a broad category, we might be talking about someone who has mechanical claws and the brain of a man. There are going to be times when each side is going to take the advantage, if you are looking at it statistically. You have the advantage of rational thought added to cybernetic arms. 'I think you’ve got to give the advantage overall to the cyborg. And I’m going to stand by that.'" Internet Archive: Details: The Cyborg and the Yogi 2006-09-30: "The Cyborg and the Yogi is a bi-weekly podcast on the relationship of science and spirituality, focusing especially on neuroscientific research relating to yoga and meditation. CyborgYogi is produced by J. Hughes, executive director of the Institute for Ethics and Emerging Technologies, and Matthew Falkowski, co-director of Samadhi and Sundari Yoga Studios in Machester Connecticut."